Kanhai Jewels offers an exclusive collection of finest quality crafted Fashion Jewellery in various colors. 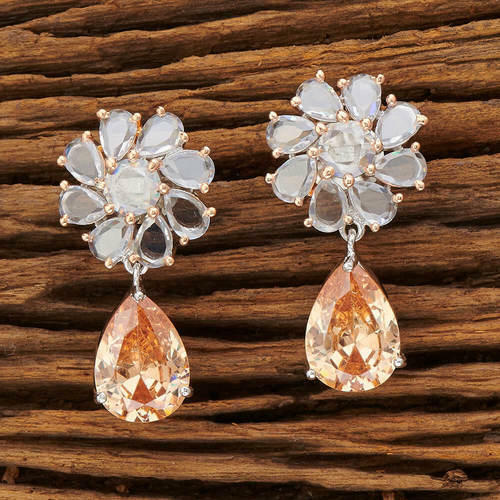 We make sure that our collection of Cz Earrings are beautiful, elegent & will surely galvanize you, because our products are unique, comfortable, fashion forward & very popular for the rich look. Base Metal of our product is Alloy, i.e Mixing of Copper & Brass. We pack all the products using quality packaging material to ensure safe and secure transportation. We are leading manufacturer and supplier of CZ Chand Earring with rose gold plating 66876. It is manufactured using quality raw materials and latest technology. We are leading manufacturer and supplier of CZ Classic Earring with rose gold plating 66884 . It is manufactured using quality raw materials and latest technology. Note- Bulk Quantity buyers are preferred from our side. We are leading manufacturer and supplier of Black plated CZ Classic Earring with rose gold plating 66886 . It is manufactured using quality raw materials and latest technology. We are leading manufacturer and supplier of CZ Classic Earring with rose gold plating 66887 . It is manufactured using quality raw materials and latest technology. We are leading manufacturer and supplier of CZ Classic Earring with rose gold plating 66888. It is manufactured using quality raw materials and latest technology. We are leading manufacturer and supplier of CZ Short Earring with 2 tone plating 66880. It is manufactured using quality raw materials and latest technology. We are leading manufacturer and supplier of C CZ Short Earring with rhodium plating 66883. It is manufactured using quality raw materials and latest technology. We are leading manufacturer and supplier of CZ Short Earring with gold plating 66882 . It is manufactured using quality raw materials and latest technology. We are leading manufacturer and supplier of CZ Tops with rhodium plating 66856. It is manufactured using quality raw materials and latest technology. We are leading manufacturer and supplier of CZ Tops with rose gold plating 66859. It is manufactured using quality raw materials and latest technology. We are leading manufacturer and supplier of CZ Classic Earring with rose gold plating 66889 . It is manufactured using quality raw materials and latest technology. We are leading manufacturer and supplier of CZ Short Earring with 2 tone plating 66877 . It is manufactured using quality raw materials and latest technology. We are leading manufacturer and supplier of CZ Short Earring with rhodium plating 66879. It is manufactured using quality raw materials and latest technology. We are leading manufacturer and supplier of CZ Short Earring with rhodium plating 66881. It is manufactured using quality raw materials and latest technology. We are leading manufacturer and supplier of CZ Short Earring with rose gold plating 63106. It is manufactured using quality raw materials and latest technology. We are leading manufacturer and supplier of CZ Tops with 2 tone plating 66854. It is manufactured using quality raw materials and latest technology. We are leading manufacturer and supplier of CZ Tops with 2 tone plating 66861. It is manufactured using quality raw materials and latest technology. We are leading manufacturer and supplier of CZ Tops with 2 tone plating 66858. It is manufactured using quality raw materials and latest technology. We are leading manufacturer and supplier of CZ Tops with 2 tone plating 66864. It is manufactured using quality raw materials and latest technology. We are leading manufacturer and supplier of CZ Tops with 2 tone plating 66867. It is manufactured using quality raw materials and latest technology. We are leading manufacturer and supplier of CZ Tops with 2 tone plating 66870 . It is manufactured using quality raw materials and latest technology. We are leading manufacturer and supplier of CZ Tops with 2 tone plating 66873 . It is manufactured using quality raw materials and latest technology. We are leading manufacturer and supplier of CZ Tops with rhodium plating 66853 . It is manufactured using quality raw materials and latest technology. We are leading manufacturer and supplier of CZ Tops with rhodium plating 66855. It is manufactured using quality raw materials and latest technology. We are leading manufacturer and supplier of CZ Tops with rhodium plating 66862. It is manufactured using quality raw materials and latest technology. We are leading manufacturer and supplier of CZ Tops with rose gold plating 66857 . It is manufactured using quality raw materials and latest technology. We are leading manufacturer and supplier of CZ Tops with rose gold plating 66860. It is manufactured using quality raw materials and latest technology. We are leading manufacturer and supplier of CZ Tops with rose gold plating 66865. It is manufactured using quality raw materials and latest technology. We have an exclusive range of Intricately designed fashion jewelry & We make sure that our range Of CZ Tops with rose gold plating 66875 will galvanize you. We are leading manufacturer and supplier of CZ stud with rose gold plating 66852. It is manufactured using quality raw materials and latest technology.